The last couple of posts have been so miserable, I bet you are really glad you came! Well, we are still having earthquakes but nothing as big as "those two". I am sleeping in my living room which is stupid but, an easier exit if things fall down! 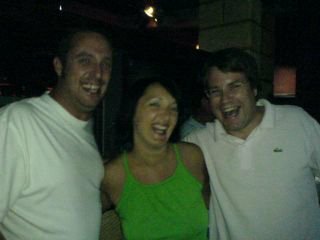 The picture above was taken during the summer on a night out with our very good friends, Roy & Tena. I met Roy in April of this year, jsut before the tourist season started. We were in a local bar (about the only one open) to watch Rangers play the League Cup final against Motherwell (won 5-1 if my memory serves me correctly). We hit it off and had so much in common. He runs one of the tour operators for the Island. In addition to football, it turned out he was a fan of poker. As a consequence we had many home games and a lot of fun as well. He is back in Scotland now before going to Cyprus for the winter season. After that, it may be Zakynthos again or Mexico.